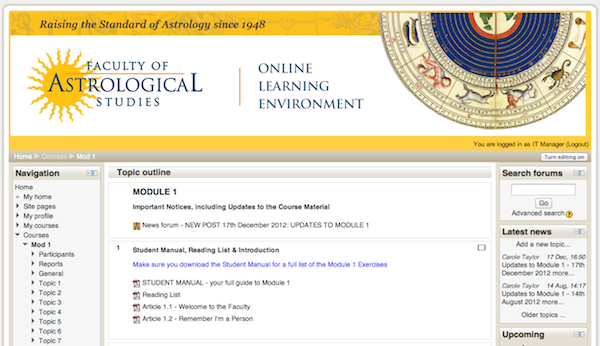 The Faculty’s Online Learning Environment (OLE) houses all the material you will need for your course, including articles, exercises, instructions for the completion of coursework, reading and resources lists, and student feedback sheets. Once you are a registered Faculty student, you can gain access to the OLE using your unique username and password. 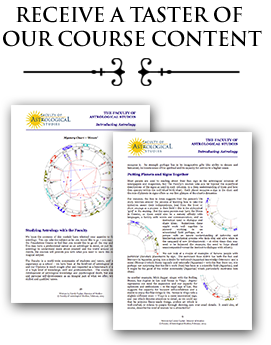 If you do not have a username and password already, you can obtain these from the Faculty’s Director of Studies, Carole Taylor – send an email to Carole at carole.taylor@astrology.org.uk or the Faculty Administrator, Tatiana Cuoco, at info@astrology.org.uk. As a Faculty student using the OLE, we are interested to have your feedback. If you have any queries or problems when using the site, contact the Director of Studies, Carole Taylor, using the link above.